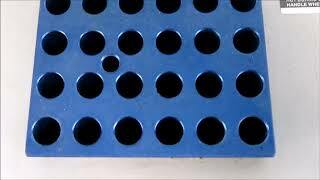 The Heat block systems from VWR are used to incubate samples. This dry bath has dual temperature ranges with a more gentle low setting between 5°C over ambient 100°C, and a higher range 75°C-150°C. Instrument includes one aluminum test tube block and plugs into a standard 115V outlet. This dry bath reaches 100 in 45 minutes, and thanks to the aluminum block, this dry heat bath heats throughout for a uniform incubation. Within the heat block is a thermometer well for external monitoring. The VWR Analog Heatblock system has been tested and is working well. All of our lab equipment comes backed with our standard warranty. Should you have any questions, please don't hesitate to contact us.